New latex at powers of creation: the predator-suits. 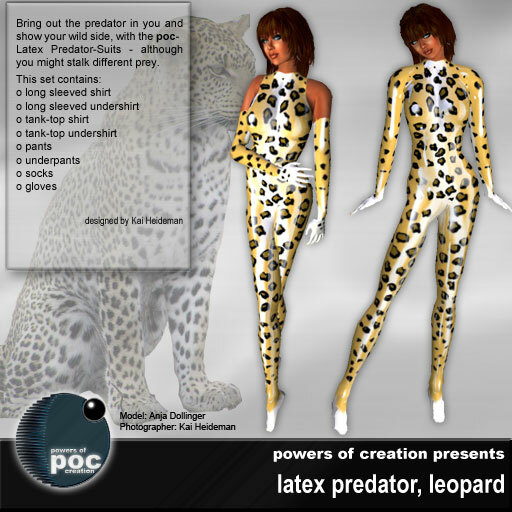 Become a cheetah, leopard or snow leopard, tiger or white tiger in stunning latex. A bargain at L$400. You can combine them with the also new matching predator-tops, priced at L$250. …and you can show your support. Pick your favourite team and wear its colours. For each of the 16 teams there is a matching top. There are also additional numbers on the jacket-layer to personalize it. We were asked to do some pictures for a german Second-Life print magazine. So, with a little bit of post-production i present Cloud Bates in our shiny Lochfraß-Suit.